Oasis Junction Mobile Home & RV Park is located in the heart of Apache Junction, Arizona, the easternmost community in the Greater Phoenix metropolitan area. Our convenient location makes getting around town easy. The Superstition Freeway, US Route 60, is 2 miles south of the park. From there it is less than a half hour to downtown Phoenix. A few miles to the west is the Loop 202, also known as the Red Mountain Freeway. This freeway loops around the Greater Phoenix Metropolitan area. Drive in any direction from our park and you have a sensory overload with a multitude of activities and adventures to choose from. Recognized for its range of outdoor recreational opportunities, Phoenix (also known as the “Valley of the Sun”) provides more than 300 days of sunshine, making it the perfect setting to enjoy biking, hiking and swimming year round. Surrounded by the scenic landscape of the Sonoran Desert and the excitement of the Old West, Greater Phoenix is an ideal place to enjoy more than 200 picturesque golf courses, Jeep tours, hot-air balloon rides above spectacular scenery, horseback riding and rock climbing. Let the American Southwest call out the adventurer in you! The Valley of the Sun is truly a shopper’s paradise with fabulous malls, unique boutiques, art galleries, antique shops and outlet centers. When it’s time for a little culture, take in a show, symphony, ballet or visit one of the numerous museums filled with Native American art and history. Greater Phoenix is a melting pot of cultural influences and is most recognized through its many culinary delights from the south-of-the-border influences like carne asada tacos or the western appeal of cowboy cut steaks to the far east delicacies of freshly prepared sushi. As one of only eight U.S. cities to have teams in all four major professional sports, Greater Phoenix is a sports enthusiast’s haven. Catch one of the many sporting events from the Arizona Cardinals, the Arizona Coyotes, the Phoenix Suns, or just and watch a Diamondbacks game in beautiful Chase Field. Greater Phoenix is a wonderful area to explore and spend some time, whether it is for a few months or on a permanent basis. From the 300 days of sunshine to the scenic landscape of the Sonoran Desert and the excitement of the Old West, Greater Phoenix offers an unbeatable quality of life. 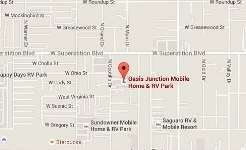 Call us at (480) 310-1113 and let’s make Oasis Junction Mobile Home & RV Park your home.